Estee Lauder Annual Gift Set purchase with purchase is coming! Get the Ultimate Color Collection Gift Set at $108 (over $800 value) with any $120 Estee Lauder purchase at any counter (except Sephora) today. The collection includes 3 full-size Pure Color Crystal Lipsticks and a lot more! Beautorium offers 15% off all Mambino Organics products. Plus receive a free Bug Away Insect Repellent with any $50 Mambino purchase. Enter code MAMBINO15 at checkout. Valid thru Oct 7. Beauty Habit offers a free limited edition Paul & Joe Pelican Cosmetic Bag and a mystery full-size product from Paul & Joe Vintage Limited Edition Collections with any $85 Paul & Joe purchase. Enter code LOVESTORY at checkout. Valid thru Oct 12. BH Cosmetics offers their 24-pcs Synthetic Brush Set for only $22. No code needed. Valid thru Sep 30. Carol's Daughter offers free Coconut Body Cleansing Cream or Ocean Body Cleansing Oil with any $40 purchase. Enter code COCONUT or OCEAN at checkout. Valid thru Sep 30. Jane Cosmetics offers 20% off any $14.99 purchase. Enter code JaneIPSY at checkout. Valid thru Oct 14. Juice Beauty offers free shipping with any purchase. Enter code FREESHIP48 at checkout. Valid thru Sep 30. Lancome offers free 5-pc gift set (a $119 value) with free 2-day shipping on any $45 purchase. Enter code OCTDELUXE at checkout. Valid thru Oct 3. Sephora offers free deluxe sample of Caudalie Firming Serum with any $25 purchase. Enter code FIRMING at checkout. Valid while supplies last. Shu Uemura offers free 2 deluxe samples and free shipping with any purchase. Gift includes 20ml Fresh Pore Clarifying Gentle Cleansing Oil and 20ml High Performance Cleansing Oil Advanced Formula. Enter code HUARENSHU at checkout. Valid thru Oct 3. Skin1 offers 10% off all Allure's Best of Beauty Award Winners. Enter code WINNER10 at checkout. Valid thru Oct 5. SkincareRx offers 22% off sitewide. Enter code BCA22 at checkout. Valid thru Oct 3. Stila offers free shipping with any purchase. No code needed. Valid thru Sep 30. Wei East offers free shipping with any $50 purchase. No code needed. Valid thru Sep 30. Yves Rocher offers a free surprise gift ($33 value) with any purchase. No code needed. Must enter thru link. Valid thru Oct 6. Beauty.com offers free deluxe Kneipp Herbal Bath Duo with any $10 purchase. No code needed. Must enter thru link. While supplies last. Beauty Sak offers 20% off plus free shipping with any $75 purchase. Enter code FALL20 at checkout. Valid for Sep 27 only. Carol's Daughter offers 20% off all Hairdress. No code needed. Plus free shipping on all $25 purchase. Enter code FALLSHIP at checkout. Valid for Sep 27 only. Dermstore offers free DHC Moisture Care Liquid LipColor in Pink Sands with any $75 DHC purchase. Enter code DHCGIFT at checkout. While supplies last. Elizabeth Arden offers free shipping, deluxe Night Cream bonus plus 7-pc Gift set (over $95 value) with any $29.50 purchase. Enter thru link and use code NIGHTBONUS at checkout. Valid thru Oct 1. Lancome offers free deluxe sample of Renergie Lift Multi-Action Day Moisturizer with any purchase. No code needed. While supplies last. MAC Cosmetics offers free shipping with any purchase. Enter code MARILYN at checkout. Valid thru Sep 30. NARS offers free 2-day shipping with any purchase of a NARSskin Optimal Brightening Concentrate. Enter code FREE2DAY at checkout. Limited time only. The Body Shop offers $10 off any $20 purchase. Enter code PEACH10 at checkout. Valid thru Sep 30. Yves Rocher offers 50% off sitewide via link, plus receive $5 off any $25 purchase. Enter code SPECIAL25YR at checkout. Valid for Sep 27 only. Luxola is now shipping to Malaysia, Indonesia and Thailand! To celebrate this, they offer a 15% off any purchase via the link. Limited time only. 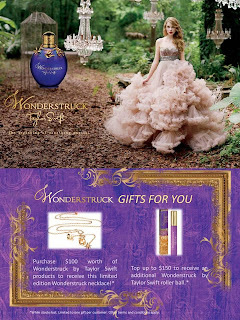 Bath & Body Works offers free limited edition Candle & Gift Bag ($11.50 value) with any purchase. Plus $1 shipping with any $25 purchase. Enter code PUMPKINGIFT at checkout. Valid for Sep 26 only. Carol's Daughter offers 20% off and free shipping with any purchase when you become a member today. Enter thru the link to become a member for only $10 (regularly $25). Valid for Sep 26 only. Cherry Culture offers 20% off sidewide. Enter code FLS20 at checkout. Valid thru Sep 30. Clarins offers free 5 deluxe samples of your choice with any purchase. No code needed. Valid thru 3am EST Sept 29. Dermstore offers a free mystery gift with any purchase. Plus receive a Superset (a $121 value) with any $125 purchase. Enter code SUPER9 at checkout. While supplies last. E.L.F. Cosmetics offers the 83-pc Essential Makeup Palette for only $3.50 (u.p. $35) with any $25 purchase. Enter code 83PIECE at checkout. Valid thru Oct 1. Fresh offers free mini Sugar Lip Polish with any $100 purchase. Enter code NICHOLS at checkout. Valid thru Sep 27. Jack Black offers free TSA-friendly All Over Wash with any $60 purchase. Enter code AOWSEPT at checkout. or change to a Turbo Wash Energizing Cleanser with code TURBOSEPT. Valid thru Oct 2. Jurlique offers free deluxe sample of Herbal Recovery Night Cream with any $45 purchase. Enter code NIGHTCREAM at checkout. Or receive an additional deluxe size of Herbal Recovery Gel with your $100 purchase. Enter code BOOST at checkout. Both codes are valid thru Sep 30. Mirabella offers 30% off sitewide. Enter code IPSY at checkout. Valid thru Nov 30. Sally Beauty offers 25% off on any $60 purchase. Enter code 555234 at checkout. Valid thru Sep 27. Shu Uemura offers 20% off plus free shipping with any $50 purchase. Enter code FALLPROMO at checkout. Valid for Sep 26 only. Shu Uemura offers free 4-pc deluxe sample set with any $65 purchase. Plus receive 10% off on Stage Performer Instant Glow, Ultime8 Sublime Beauty Cleansing Oil, or Tsuya Youthful Radiance Generator. Enter code BUZZ at checkout to receive deluxe samples of the above mentioned products plus a mini eyelash curler. Valid thru Sep 30. StriVectin offers free mini Iconic Wrinkle-Fighter with purchase of new Power Serum for Wrinkles, or free mini Neck Cream with purchase of new 360 Tightening Eye Serum. No code needed. While supplies last. Tweezerman offers a free Matchbox File with any purchase. Enter code VEFILE at checkout. Valid for Sep 26 only. Ulta Beauty offers free shipping with any $25 purchase, and an additional gift set of your choice with any $35 purchase. Choose between 3-pc Murad Essential-C set ($45 value) or Fusion Beauty 4-pc gift set ($39 value) at checkout. Enter code 82988 at checkout. 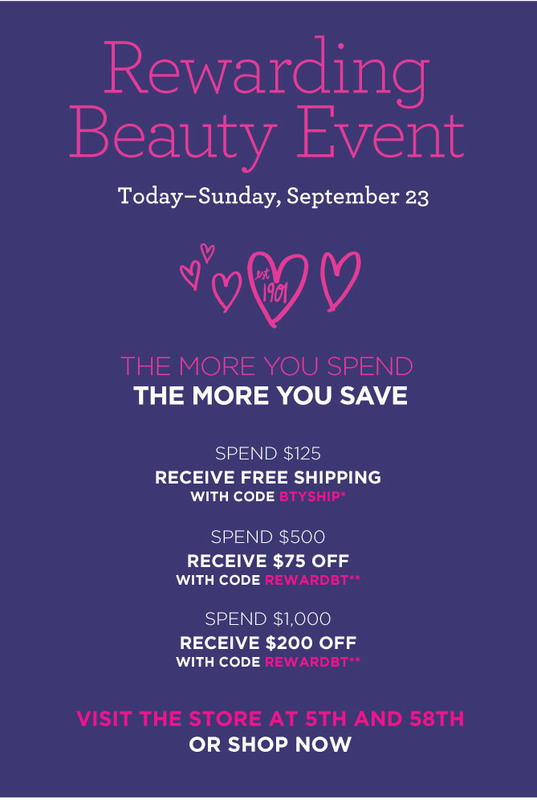 Valid for 10am - 4pm CST today Sept 26 only. Afterglow Cosmetics offers free shipping with any purchase. No code needed. Valid for Sep 25 only. Ahava offers 30% off sitewide. Enter code FALLFAN30 at checkout. Valid thru Sep 30. Beauty.com offers $15 off any $75 purchase. No code needed. Enter thru link. Valid thru Sep 30. Benefit Cosmetics offers free deluxe sample of the POREfessional and They're Real mascara with any $50 purchase. Enter code TAKEFIVE at checkout. Valid thru Sep 30. Beyond the Rack is having a Mixed Beauty event featuring Estee Lauder, Lancome, Issay Miyake, L'occitane and Clinique. 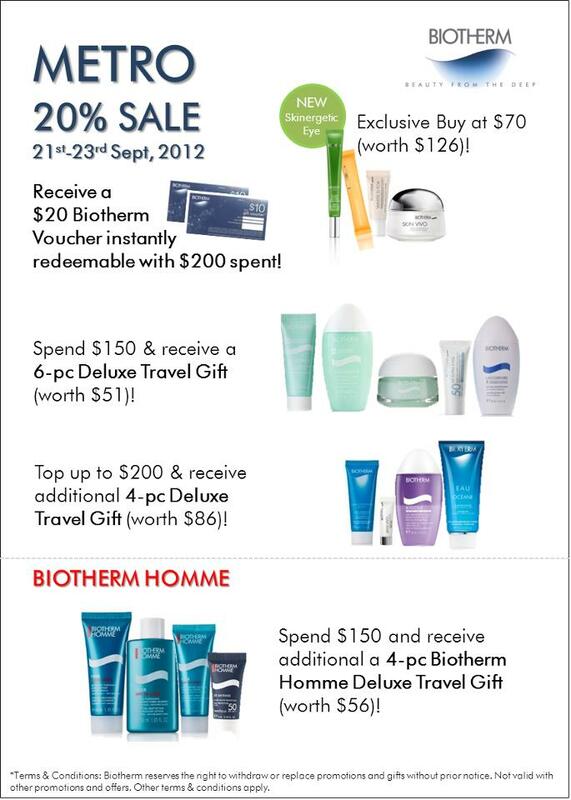 Biotherm offers free shipping with any $65 purchase. Enter code SHIPSEP at checkout. Valid thru Sep 28. BH Cosmetics offers their 88 color Neutral Eyeshadow Palette for only $10 (u.p. $24.95). No code needed. Enter thru link. Valid thru Sep 26. Bobbi Brown offers free shipping and 15ml deluxe sample of Brightening Hydrating Lotion with any purchase. Enter code BRIGHT9 at checkout. Valid thru Sep 28. Borghese offers 25% off sitewide. Enter code FALL25 at checkout. Valid today Sept 25 between 12 PM EST and 4 PM EST only. Plus receive a free 5-pc gift set with any $50 purchase. Excludes Spa at Home Accessories. Crabtree & Evelyn offers free full size 100g Himalayan Blue Hand Therapy for only $8 with any $45 purchase (u.p. $19). Enter code HB09128 at checkout. Valid thru Oct 1. Dermstore offers SmartLash Eyelash Enhancer at $24.95 only (80% savings). Plus receive free shipping and a free mystery gift with your purchase. Enter thru link. Valid thru Sep 26. E.L.F. Cosmetics offers free shipping with any $25 purchase. Enter code SHIP25 at checkout. Valid thru Oct 1. Erno Laszlo offers free 30ml Phormula 3-9 Balm (a $144 value) with any purchase from the Phormula 3-9 collection. Enter code FREEBALM at checkout. While supplies last. Folica offers 20% off when you purchase 2 or more products. Enter code FALLSPECIAL at checkout. Valid thru Sep 27 3AM EST. Fresh offers free deluxe samples of Soy Face Cleanser and Brown Sugar Eau De Parfum with any $100 purchase.Enter code FACESAVERS at checkout. Valid thru Sep 27. Juice Beauty offers a free full size Organic Treatment Oil ($36 value) with any $50 purchase. Enter code 7YEARS at checkout. Valid for Sep 25 only. La Mer offers free shipping and a deluxe sample of The Hand Treatment with any purchase. Enter code OPTIMUM at checkout. Valid thru Sep 30. MAC Cosmetics offers free shipping with any purchase. Enter code NEWS at checkout. Valid thru Sep 30. 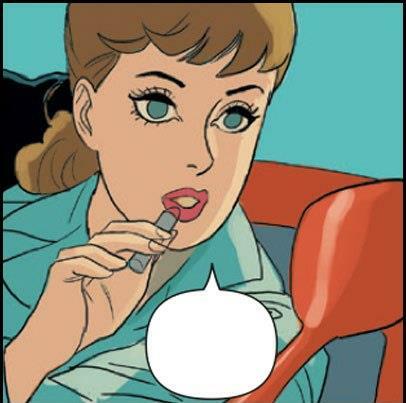 Prescriptives offers free 14-day supply of False Eyelashes Mascara with any $50 purchase. No code needed. Valid thru Sep 27. Sephora offers free deluxe sample of Perricone MD Vitamin C Ester 15 antiaging cream with any $25 purchase. Enter code ESTER at checkout. While supplies last. Stila offers free shipping with any purchase. Enter code FASHIONSHIP at checkout Valid thru Sep 30. Trish McEvoy offers 2 deluxe samples of Beauty Booster SP 15 Lip Gloss in Brightening Pink and Beauty Booster Lip Balm SPF 15 with any purchase. No code needed. Valid thru Sep 28. Shipping is free with $50 purchase. Yves Rocher offers 50% off sitewide in their private sale. No code needed. Enter thru link. Valid thru Oct 9. Lancome is having their La Vie Est Belle Pre-launch at Robinsons Raffles City (now to 27 Sep) where you can treat yourself to a 1-hr Génifique Youth-Activating Facial or a 1-hr full makeover, hair-styling and photoshoot, by simply purchasing a $100 fully redeemable voucher! RSVP at lc06rrc@singnet.com.sg or call 6339 7731 for more information. Aveda offers free shipping and free Damage Remedy Sample Trio with any $30 purchase. Enter code REMEDY92 at checkout. Carol's Daughter offers $10 off any $40 purchase. Enter code SURPRISE at checkout. Valid for Sep 24 only. CosMedix offers free 15ml Phytoharmony Balancing Moisturizer ($46 value) with any purchase. Enter code PHYTOFALL at checkout. Valid thru Sep 25. Dermstore offers free La Roche-Posay's Mela-D Serum ($58 value) with any $50 purchase on La Roche-Posay products. Plus receive a free mystery gift on any purchase, or a gift of your choice on any $100 purchase. No code needed. While supplies last. Estee Lauder offers a 7-pc gift set (up to $125 value) with any $45 purchase. Gifts includes your choice of 4-pc skincare (eye cream, day cream, serum, and cleanser), 2-pc lip shade (gloss and lipstick), and a cosmetics bag. No code needed. Enter thru link. While supplies last. Koh Gen Do offers 20% off UV Face Powder SPF20 PA++. No code needed. Enter thru link. Valid thru Sep 30. MyChelle offers 20% off sitewide. Enter code sept20 at checkout. Valid thru Sep 30. Ojon offers free shipping plus free deluxe sample of Rare Blend Oil Total Hair Therapy with any $35 purchase. Enter code RESULTS at checkout. Valid thru Sep 28. Pur Minerals offers free Wristlet with any $20 purchase. Enter code BAG20 at checkout. Valid thru Oct 7. Saks is having a gift card event. Enter code SEP2012 at checkout to get your gift card with any $250 or more purchases. For beauty, spend $100 to receive a sample-filled tote bag with code BEAUTY3M for Mustard color, BEAUTY3G for Green color or BEAUTY3N for Navy color. Plus they are having a lot of gorgeous beauty gifts as well. Check the details online. Valid thru Sep 28. Skin1 offers 12% off sitewide. Enter code FALL12 at checkout. Or top up your purchase to $199 and receive 15% off sitewide. Enter code FALL15 at checkout. Both codes valid for Sep 24 only. Smashbox is having a blowout sale of up to 75% off on selected products. No code needed. Enter thru link. While supplies last. Time to Spa offers $25 off any $100 or more purchase. Enter code THANKYOU25 at checkout. Valid thru Sep 30. Metro is offering 20% off storewide for cardmembers this F1 weekend from 21 to 23 September. Shopping hours till 10pm. Some beauty brands offer extra 10% on top, including my favorite Pola! =) There are also many great gift with purchase offers as well, I'll post the details once I have them. Bergdorf Goodman twice-a-year beauty event is here again! Receive free shipping with $125 beauty purchase, $75 off any $500 beauty purchase, or $200 off any $1000 purchase, plus there are 70+ GWP offers as well! Use code BTYSHIP and REWAREDBT at checkout. Valid thru Sep 23. Barney's Love Yourself Beauty Event is happening today as well. Spend $200 on beauty to receive reprotedly a fantastic goodie bag filled with full-size/deluxe samples/normal samples of products. No code needed. Valid thru Sep 22.
bareMinerals offers 20% off storewide. Enter code GLAMMY8 at checkout. Valid for Sep 20 only. Beauty.com offers free deluxe sample of Fresh Supernova Mascara with any $10 purchase. No code needed. Enter thru link. While supplies last. Bliss offers free 5-pc kit with bliss face and body faves with any purchase of $50 or more. Use promo code BLSFAVES at checkout. Offer valid until Sep 30. Bliss offers free SK-II 4-pc travel essentials kit ($100 value) with any sk-II product purchase of $250 or more. Use promo code TREATSK2 at checkout. Offer valid until Sep 30. Bliss offers free Clarisonic mesh bag and brush head with any clarisonic purcahse of $100 or more. Use code ORANGE at checkout. Offer valid until Sep 30. Bliss offers free Sisley Zebra Bag with 5-pc minis with any Sisley purchase of $250 or more. Use promo code ZEBRA at checkout. Offer valid until Sep 30. Caswell Massey offers free Vic's Washcloth (a $12 value) with any $45 purchase of Men's 1752 collection. Enter code VWG12 at checkout. Valid thru Sep 23. Clinique offers free shipping with any purchase. No code needed. Valid thru Sep 22. Dermstore offers free full size Jane Iredale Mystikol Power Eyeliner and Highlighter with any $100 Jane Iredale purchase. Enter code JANEGFT at checkout. While supplies last. E.L.F. Cosmetics offers free $20 Mystery Gift Bag with any $20 purchase. Enter code MYSTERYBAG at checkout. Valid for Sep 20 only. Kate Somerville offers free travel size DermalQuench Liquid Lift Advanced Wrinkle Treatment with any $150 purchase. No code needed. While supplies last. Macy's is having their Beauty Scene event. 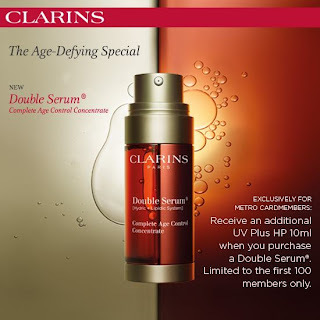 There are 100+ GWP offers available including Estee Lauder, Clarins, and more. While supplies last. Sephora offers a 7-pc skincare goodies bag ($89 value) with any $25 purchase. Enter code BESTSKIN at checkout. While supplies last. Shu Uemura offers 15% off plus free shipping on all purchase. Enter code SHUSHU4AFF at checkout. Valid thru Sep 21. Ulta Beauty offers $25 off any $100 purchase. Enter code 85732 at checkout. Valid for Sep 20 only. Ahava offers free full size product with any $60 purchase. Enter code CHOOSEHAND for full size Mineral Hand Cream ($21 value), code CHOOSEMINBO for Water Lily & Guarana Cream Wash ($23 value), or code CHOOSEDAY for Essential Day Moisturizer ($39.50 value). Valid thru Sep 21. Aveda offers 4 free Top-rated samples of your choice and free shipping with any $40 purchase. No code needed. Select your favorites at checkout. Valid for Sep 19 only. Beauty.com offers 20% off storewide. Must enter thru link. Valid thru Sep 20. Some brands are excluded. 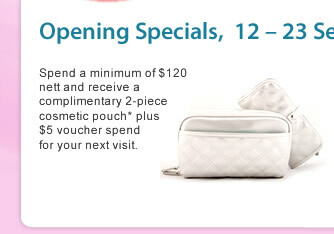 Note that this can be stacked with the gift bag offer on $100 purchase ($80 after discount). Just click the banner at the homepage to add the gift bag to your cart. Beauty Sak offers $10 off plus free shipping plus a free deluxe sample of DDF Advanced Firming Cream with any $60 purchase. Enter code DDF12 at checkout. Valid thru Sep 24. Benefit Cosmetics offers a free Tweezerman for Benefit ProCurl Curler with any $40 purchase. Enter code LOVELYLASH at checkout. Valid thru Sep 25. Carol's Daughter offers $5 off any Monoi Repairing product. Enter code IPSY5 at checkout. Valid thru Oct 15. Dermstore offers free mystery gift with any purchase, or upgrade to DCL Light Textured Moisturizer with any $100 purchase. No code needed. While supplies last. E.L.F. Cosmetics offers $5 off plus a $5 gift card for new order with any $20 purchase. Enter code FIVE at checkout. Valid thru Sep 24. Folica offers $25 off any $100 purchase plus free shipping. Enter code FALLTIME at checkout. Valid thru Sep 22. Fresh offers free deluxe sample of Creme Ancienne with any $100 purchase. Enter code QVCFaves at checkout. Valid thru Sep 20. Hautelook is having a Jonathan Product sale event today and tomorrow. Jack Black offers free shipping on any order containing Double Duty Face Moisturizer. Enter code DOUBLEDUTY at checkout. Valid thru Sep 24. Juice Beauty offers free full size Organic Facial Rejuvenating Mask with any $100 purchase. Enter code OFRM at checkout. While supplies last. MAC Cosmetics offers free shipping with any purchase. Enter code CONTOUR at checkout. Valid thru Sep 23. MD Formulations offers free shipping with any purchase. Enter code MDFFREESHIP at checkout. Valid for Sep 19 only. NARS Cosmetics offers free shipping and mini Smudge Proof Eyeshadow Base with any purchase. Enter code ESBASE12 at checkout. While supplies last. Ole Henriksen offers free Nurture Me Eye Creme (a $28 value) with any $75 purchase. Enter code NURTUREME at checkout. While supplies last. Origins offers free 3 deluxe samples of your choice with any skincare purchase. No code needed. Valid thru Sep 29. Sally Beauty offers 20% off any $50 purchase. Enter code 555229 at checkout. Valid thru Sep 20. Shu Uemura offers free deluxe 4-pc sample set with any $65 purchase. Gift includes deluxe samples of Depsea Hydrability Intense Moisturizing Concentrate, Depsea Hydrability Moisturizing Cream, Depsea Hydrability Moisturizing Emulsion, and Depsea Hydrability Alnight Quench. Enter code ALNIGHT at checkout. Valid thru Sep 23. SkinStore offers 20% off sitewide. Enter code SSANNIV at checkout. Valid thru Oct 1. SpaLook offers $50 off any $200 purchase. Enter code 50FALL at checkout. Or get $20 off any $100 purchase with code 20FALL at checkout. Valid thru Oct 1. StriVectin offers a free Eye Treatment sample with any order. Enter code SDEYE for Smoothes Eye Concentrate for Wrinkles, or code TLEYE for Lifts New 360 degrees Tightening Eye Serum. Valid while supplies last. Ulta Beauty offers a mini Fragrance of your choice (up to a $20 value) with any $35 purchase. Choose from Gucci Premiere 5ml, Jennifer Aniston 7.5ml, Acqua Di Gioia 10ml, or Versace Bright Crystal 5ml. Enter thru the link and add your choice to cart. While supplies last. Von Maur offers a free Clinique 7-pc bonus gift set (a $65 value) with any $23.50 Clinique purchase. No code needed. Valid while supplies last. Burberry is launching their Body Eau de Toilette, a new, lighter version of their Body Fragrance from 21 - 27 Sept at Metro Paragon. First 50 card members to purchase any 60ml fragrance from the Body range will receive an additional Body EDP 10ml Roll on. Aveda offers free overnight shipping and prep sampler trio with any $40 purchase. Enter code PREP92 at checkout. Valid for Sep 17 only. Bobbi Brown offers free shipping plus 2 deluxe samples of Vitamin Enriched Face Base and Lash Glamour Extreme Lengthening Mascara with any purchase. Enter code BACK912 at checkout. Valid thru Sep 20. Carol's Daughter offers Hair Milk Shampoo & Conditioner Set for only $10 (regular price $31). Plus you will also receive a new Hair Milk Pudding sample. No code needed. Enter thru link. Valid thru Sep 20. Clinique offers free minis of Quickliner for Eyes in Really Black, and Take the Day Off Makeup Remover for Lids, Lashes & Lips with any purchase. Enter code INTENSE at checkout. Valid thru Sep 23. Dermstore offers 15% off on Glytone products. Plus receive a mystery gift with any purchase, or a Rahua Travel Size Shampoo & Conditioner Set with $100 purchase. No code needed. Valid thru Sep 23. Dr. Brandt offers free Dark Circles Away travel size & Pores No More Anti-aging Mattifying Lotion travel size with any $80 purchase. No code needed. While supplies last. 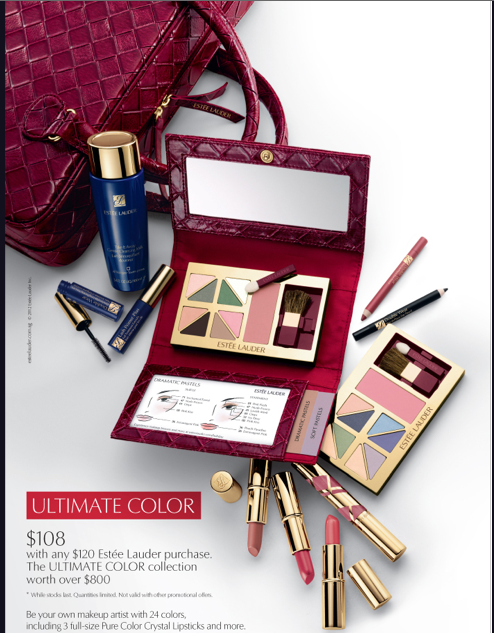 Estee Lauder offers free Instant Lift Trio with any $65 purchase. Gift includes deluxe samples of Perfectionist [CP+R], Advanced Night Repair, and Illuminating Perfecting Primer. Enter code INSTANTLIFT at checkout. Valid thru Sep 20. Janson Beckett offers 50% off sitewide. Enter code FALL12 at checkout. Valid thru Sep 30. La Mer offers free shipping and a deluxe sample of the Moisturizing Soft Cream with any purchase. Enter code REPAIR at checkout. Valid thru Sep 20. Neiman Marcus is having a Gift Card offer with any $250 or more regular priced purchase. Plus double your gift card's value when you purchase regular priced both Apparel and a Shoe/Bag purchase. Enter code BET2GET at checkout. Valid thru Sep 19. Ojon offers free shipping plus sample duo of best selling Damage Reverse Shampoo and Conditioner with any purchase. Enter code FALL2012 at checkout. Valid thru Sept 21. Perricone MD offers a free 5-pc Anniversary Travel Collection hand-selected by Dr. Perricone (a $113 value) with any $150 purchase. Enter code 15GWP at checkout. Valid for Sep 17 only. Pur Minerals offers free shipping and a full sized Correcting Primer with any $50 purchase. Enter code SEPTPRIME at checkout. Valid thru Sep 23. Sephora offers free travel sizes of bareMinerals Overnight Serum, Mineral-based Foundation, and luxurious Kabuki Brush with any $25 purchase. Enter code BARESET for luminous effect, or MATTESET for matte finish. While supplies last. Shu Uemura offers a free Shu Uemura's Eye & Cheek Travel Palette (a $65 value) with any $125 purchase. Enter code BEAUTY247 at checkout. Valid thru Sep 18. SkincareRx offers 20% off sitewide. Enter code MASKPEEL20 at checkout. Valid thru Sep 19. Smashbox offers free Photo Set Pressed Powder deluxe sample with any $25 purchase. Enter code POWDERFAIR for Fair color, or POWDERLT for light color. Valid thru Sep 19. Shipping is free with any purchase. The Body Shop offers $20 off any $60 purchase. Enter code FALL20 at checkout. Valid for Sep 17 only. Time to Spa offers free 5-pc Elemis Face & Body Beauty Collection gift set with any $75 purchase. Gift includes 15ml Pro-Collagen Marine Cream, 15ml Papaya Enzyme Peel, 60ml Skin Nourishing Milk Bath, 20ml Pro-Collagen Hand and Nail cream, and a blue cosmetics bag. Enter code MYBEAUTY at checkout. While supplies last. Trish McEvoy offers free shipping and a 4-pc gift in a travel-ready pouch with any $75 purchase. Gift includes deluxe samples of Beauty Booster® Serum, Lash Enhancer Nighttime Conditioning Treatment (one-month supply! 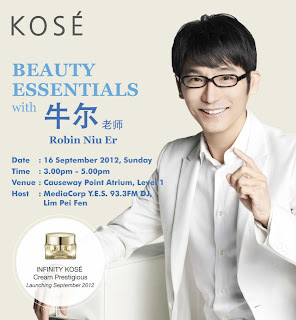 ), Beauty Booster® Eye Serum and Precious Pink Jasmine Eau de Parfum. Enter code TMLASHES at checkout. Valid thru Sep 21. 100% Pure offers free full size 500ml Body Wash in assorted flavors with any $100 purchase. No code needed. While supplies last. AskDerm offers 25% off plus free shipping with any purchase. Enter code FLASH912 at checkout. Valid thru Sep 16. Beauty Collection offers free travel size Volumizing Creme with purchase of any two full size DR Volume Extend by Cristophe products. Enter code drcristophe at checkout. Valid thru Sep 30. Bon-Ton offers 15% off any cosmetics purchase. Enter code MILLION12SP at checkout. 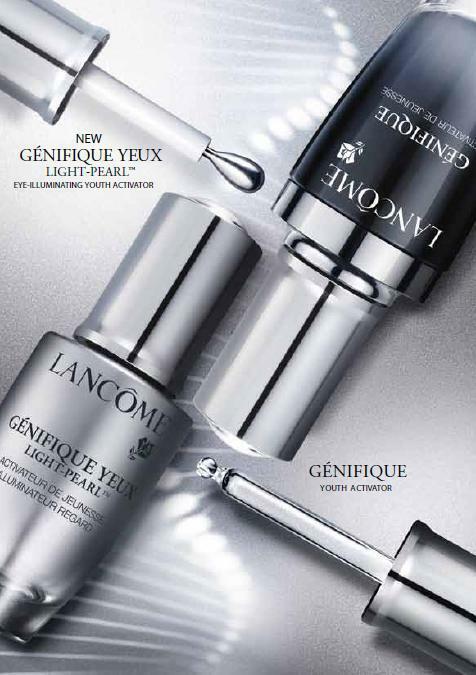 They are also having a Lancome GWP currently. Carol's Daughter offers free shipping on any order. No code needed. Valid thru Sep 16. Dermstore offers free mystery gift on all orders. Or upgrade to a Carita Lagoon Gelee ($20 value) with any $75 purchase. No code needed. While supplies last. E.L.F. Cosmetics offers 50% off on $20 Studio products purchase. Enter code STUDIO50 at checkout. Valid for Sep 15 only. Estee Lauder offers a free Moisture To Go Duo with any $50 purchase. Gift includes deluxe samples of Advanced Night Repair and Hydrationist Maximum Moisture Creme. Enter code MOISTURETOGO at checkout. Valid thru Sep 16. Gilt is having an Hourglass Cosmetics sale event starting today. H2O Plus offers free 5-pc Gift set in a cosmetics bag (a $53 value) with any $28 purchase. Enter code FALL12US at checkout. While supplies last. Jack Black offers free 45ml Double Duty Face Moisturizer SPF 20 with any $70 purchase. Enter code PROSERIES12 at checkout. Valid thru Sep 20. John Masters Organics offers 25% off on all bodycare purchases. Enter code body12 at checkout. Valid thru Sep 17. Juice Beauty offers $25 off any $100 purchase. Enter code 25BIG at checkout. Or get $20 off any $75 purchase with code 20BIG, $10 off any $50 purchase with code 10BIG, or $5 off any $35 purchase with code 5BIG. All these codes offer free shipping as well. Valid thru Sep 17. MAC Cosmetics offers free shipping with any purchase. Enter code MICHELE at checkout. Valid thru Sep 16. Murad Skincare offers 20% off sitewide. Enter code SAVE20 at checkout. Valid thru Sep 19. NARS Cosmetics offers free shipping on any purchase. Plus receive a free travel sized Eye Makeup Remover with purchase of any new Eyeliner Stylo. No code needed. While supplies last. Trish McEvoy offers free deluxe samples of Eye Base Essentials, Beauty Booster Eye Serum and Beauty Booster Lip Balm SPF 15 with any purchase. No code needed. Shipping is free with $50 purchase. Valid thru Sep 16. 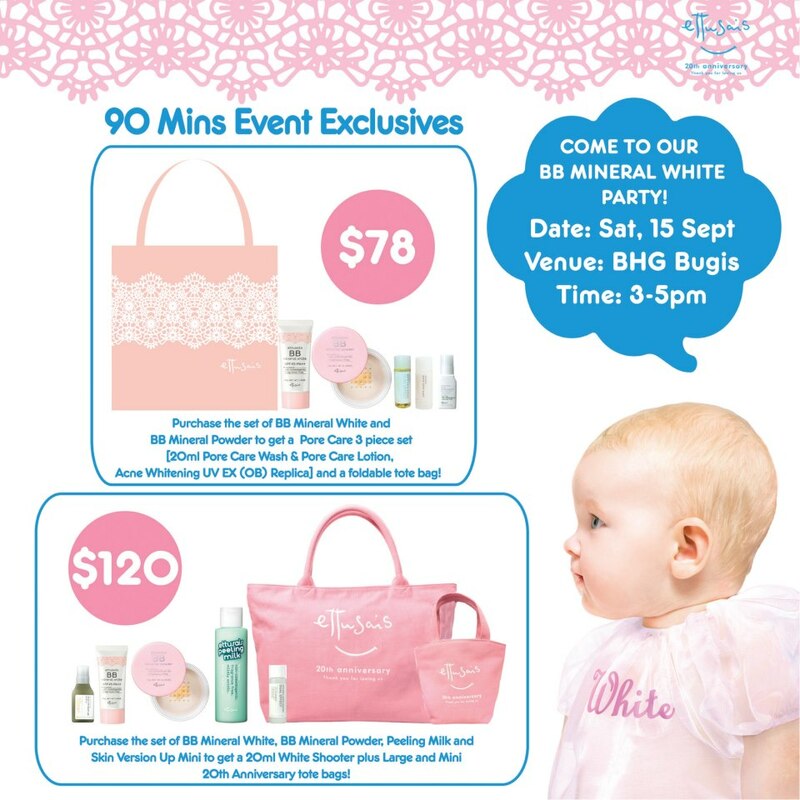 Ettusais is having a BB Mineral White Party this Saturday 3-5pm (15th Sept) at BHG Bugis. They offer two special buy sets at the event. Check out the details below and register your attendance via ettusais@shiseido.com.sg or 6739 8679. Shiseido offers a complimentary 45-minute Revital massage and mask treatment at Shiseido Takashimaya and also a sample of the Revital Vital-Perfection Science Cream AAA. Available from 14th to 20th September. Call 6735 1039 to make your appointment now! Beauty.com offers free Alterna deluxe sample Bamboo UV+ Rehab Deep Hydration Masque with any $10 purchase. Enter thru link. While supplies last. Their $200 value gift bag with any $100 purchase promotion is still on. Just click on the banner at their homepage to add it to your bag! Bliss offers 25% off any Pro size products. Enter code BLISSPROS at checkout. Valid thru Oct 10. 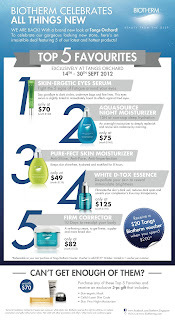 Bliss offers a free bag of 4-pc travel sized Bliss Head to Toe bests (a $75 value) with any $75 purchase. Enter code BLSFAVES at checkout. Valid thru Sep 30. Bon Ton is also offering a Lancome gift with purchase set, though the gift bag they offered is of different design. Get the following gifts with any $35 Lancome purchase with code LIFT, NOLINES or HYDRATE to choose your desired bag. Details below. Dermstore offers 15% off on Peter Thomas Roth products. Enter code SAVE15PTR at checkout. Valid thru Sep 19. Dr. Dennis Gross Skincare offers a deluxe Extra Strength Alpha Beta Peel with any $35 purchase. Enter code FAVORITE at checkout. Valid thru Sep 17. Elizabeth Arden offers free shipping plus deluxe samples of Prevage Anti-aging Moisture Cream SPF 30 and Prevage Anti-aging Overnight Cream with any purchase. Enter code AMPM at checkout. Valid thru Sep 14. Folica offers a free full size Solia Professional Hair Dryer (a $90 value) with any $125 purchase. Enter code SOLIADRYER at checkout. Valid thru Sep 14 3am EST. Giorgio Armani Beauty offers free new Maestro Foundation #5.5 (1ml) and Maestro Concealer #4 (1ml) plus free shipping with any beauty purchase. Enter code MAESTRO2 at checkout. Valid thru Sep 15. Nordstrom is having a private beauty event where over 40 beauty gift with purchase are offered. Must enter thru link. While supplies last. Sephora offers free mini Prada Candy Eau de Parfum Spray with any $25 purchase. Enter code CANDY at checkout. While supplies last. The Body Shop offers free shipping and a free Camomile Gentle Eye Makeup Remover with any $30 purchase. Enter code CAMOMILE at checkout. While supplies last. Ulta Beauty offers free beauty bag filled with 9 samples (a $35 value) with any $35 purchase. Enter thru link and add the bag to your cart to enjoy the offer. Valid thru Sep 15. Yves Rocher offers free shipping and new feminine fragrance So Elixir Purple Eau de parfum 5ml bottle with any $20 purchase. Enter code ELIXIR20 at checkout. Valid for Sep 13 only. 100% Pure offers 10% off all Cabernet Grape & Red Wine Resveratrol products. Enter code PUREGRAPES at checkout. Valid thru Sep 13. Afterglow Cosmetics offers free shipping with any purchase. No code needed. Valid for Sep 12 only. Beautorium offers 15% off on Kimberly Sayer products. Enter code KIMBERLY15 at checkout. Plus receive a free full size Pure Lavender Toner with any $75 Kimberly Sayer purchase. Valid thru Sep 16. Beauty Sak offers free shipping with any $25 purchase. Enter code FREESHIP at checkout. Valid thru Sep 13. Bliss offers free deluxe sample of La Mer The Eye Concentrate with any La Mer purchase. Enter code EYECLM at checkout. Valid thru Sep 20. Erno Laszlo offers free full size 30ml Phormula 3-9 Balm (a $144 value) with any purchase from the Phormula 3-9 collection. Enter code FREEBALM at checkout. While supplies last. Clinique offers free mini Superbalm Moisturizing Gloss in Raspberry with any $30 purchase. Enter code COLOUR at checkout. Valid thru Sep 23. Jurlique offers a Skincare Show Stopper set (a $202 value) for only $52 which is a 74% savings! Last time I saw this set was more than 2 years ago, so I have already ordered mine! yeah! Enter thru link and code JURLIQUETODAY at checkout. Valid for Sep 12 only while supplies last. L'occitane offers free 5-pc Immortelle Gift Set in a cosmetics bag with any $65 purchase. Enter code PRECIOUS at checkout. While supplies last. La Prairie offers a free 4-pc gift set with any $350 purchase. Gift includes 7ml Cellular Power Serum, 5ml Cellular Power Charge Night, a vial of Cellular Power Infusion and a silver cosmetics bag. Enter code POWERUP12 at checkout. Valid thru Oct 1. Macy's offers free 7-pc Estee Lauder gift set (up to $105 value) with any $35 Estee Lauder purchase. 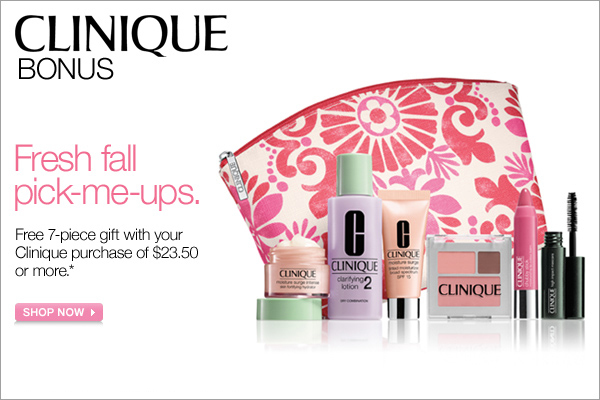 Plus receive additional chic Lip Gloss Trio (up to $55 value) with any $70 purchase. Valid thru Sep 23. 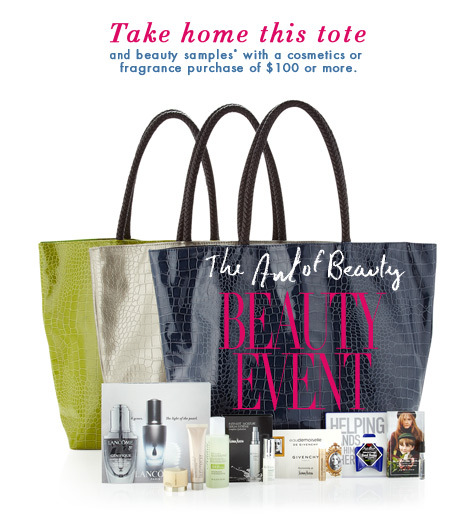 Neiman Marcus offers a free beauty tote filled with samples with any $100 beauty & fragrance purchases. Plus receive great GWPs from 60+ brands. All promotion valid thru Sep 17 8am. Nordstrom offers free Lancome Cosmetics Cases filled with deluxe samples (up to $112 value) with any $39.50 Lancome purchase. Enter code SILVER or GOLD at checkout. While supplies last. Origins offers free deluxe samples of Plantscription Serum and Plantscription Eye Treatment plus free shipping with any $30 purchase. Enter code YOUNGER at checkout. Valid thru Sep 18. Pur Minerals offers 25% off Spring & Summer collection. Enter code ENDLESS25 at checkout. Valid thru Sep 16. Sabon offers free shipping with any $49 value. No code needed. Valid thru Sep 14. Shu Uemura offers free deluxe 3 pc sample set (a $36 value) with any $65 purchase. Gift includes deluxe sample of Stage Performer Instant Glow, Eye Liner Brush, and Eyelash Curler. Enter code PISTACHIO at checkout. While supplies last. Trish McEvoy offers free deluxe travel size of two Eyeconic Trish essentials with any purchase. Gift includes Eye Base Essentials and Beauty Booster Eye Serum. No code needed. Valid thru Sep 14. Ulta offers free Hydroxatone Deep Wrinkle Concentrate Targeted Serum and Liftalyze Eye Lifting Serum (a $63 value) with any $35 purchase. Enter thru link. While supplies last. Murad is launching their latest Hydro Dynamic Ultimate Moisture at Metro Paragon from 21-23 Sep. Enjoy the introductory special for Metro Cardmembers: Purchase the Hydro Dynamic Ultimate Moisture for eye and receive a complimentary Eye Lift Illuminator worth $79, a Murad membership together with a $120 facial voucher. Plus enjoy 20% off regular products! Ahava offers free shipping on all orders. Enter code SHIPCOMFORT at checkout. Valid thru Sep 12. Beauty.com offers free Anastasia Lash Genius Waterproof Topcoat deluxe sample & mini Travel Tweezers ($21 value) with any $10 purchase. No code needed. Must enter thru link. While supplies last. Beauty Encounter offers additional 20% off on clearance items. Enter code SEP429 at checkout. Valid thru Sep 30. Benefit Cosmetics offers a free deluxe Sun Beam & It's Potent Eye Cream mini with any purchase. Ener code BENECARD at checkout. Valid thru Sep 18. Bloom offers a free 6-pc Anti-Aging + Rescure Kit in a Cosmetics Bag from Dermelect Cosmeceuticals ($25 value) with any $40 Bloom purchase. Enter code DERMELECT at checkout. Valid thru Sep 15. Cosme-De offers up to 60% off on masks purchase. Plus receive a 50ml Kinuyuki Face Cataract Aqua Gel ($50 value) with any purchase of Masks special. Enter code 24MASKGT at checkout. While supplies last. E.L.F. Cosmetics offers free $20 mineral products with any $20 purchase. Add the products in your cart and use code MIN20 at checkout. Valid thru Sep 17. Fresh offers free mini Sugar Lip Treatment Advanced Therapy with any $100 purchase. Enter code FRESHTURNS21 at checkout. Valid thru Sep 14. Kiehl's offers free shipping on all $35 or more orders. No code needed. Valid thru Sep 16. La Mer offers free shipping and a sample of The Regenerating Serum with any purchase. Enter code TEST at checkout. Valid thru Sep 16. MAC Cosmetics offers free 2nd day shipping with any purchase. Enter code OFFICE at checkout. Valid thru Sep 12. Nordstrom offers a free 5-pc Shiseido gift set (up to $73 value) with any purchase of 2 full size Shiseido Skincare Products. While supplies last. Ojon offers free shipping on all orders. No code needed. Valid thru Sep 14. Thymes offers 30% off Mandarin Coriander collection. Enter code Professor at checkout. Valid for Sep 11 only. Too Faced offers a free deluxe Primed & Poreless Face Primer with any $50 purchase on complexion products. Enter code FLAWLESSFACE at checkout. While supplies last. Yves Rocher offers 50% off all Make Up products. Enter thru link. Valid thru Sep 23. Plus enjoy 15% off entire site with code YR15OFF at checkout. Valid for Sep 11 only. 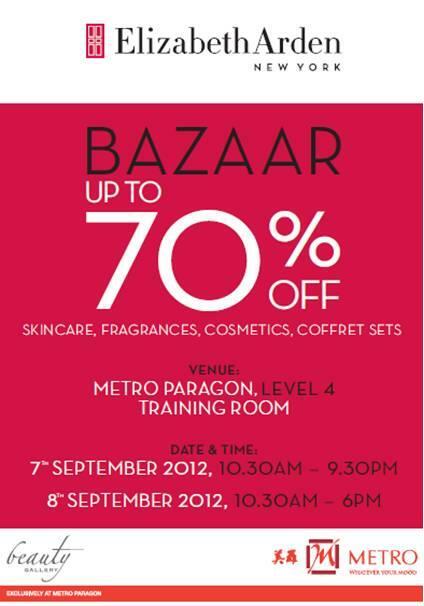 Elizabeth Arden at Metro Paragon offers a special purchase with purchase this coming Thursday (13 Sept). Purchase any Beautiful Color Eye Color and get the following mascara set at $29 (Retail: S$43). Luxola is having an exclusive launch of Sigma Beauty. Get a free E-05 Eyeliner Brush with any $20 Sigma Beauty purchase. Valid thru Sep 16. Aveda offers free shipping and a free top rated Sample Trio with any $30 purchase. Enter code FAVES92 at checkout. Valid thru Sep 16. Bobbi Brown offers free shipping, a mini Smokey Neutrals Eye Palette and deluxe sample of Extreme Party Mascara with any $100 purchase. Enter code BELLINI at checkout. Valid thru Sep 13. Carol's Daughter offers 25% off sitewide. Enter code SAVE25 at checkout. Valid thru Sep 11. Clarins offers a free 6-pc gift set (a $96 value) with any $80 purchase. Enter code FALLBEAUTY at checkout. Gift includes deluxe samples of One Step Gentle Exfoliating Cleanser, Extra Firming Night Cream, Toning Lotion with Camomile, Extra Firming Day Cream, Beauty Flash Balm and a cosmetics bag. Valid thru Sep 11. Dermstore offers 20% off on PMD personal microderm device. No code needed. Valid thru Sep 16. Plus receive a free mystery gift with any purchase, or upgrade to a pH Advantage Daily Antioxidant Moisturizer SPF 15 ($45 value) with any $100 purchase. Elizabeth Arden just launched their new purchase with purchase. 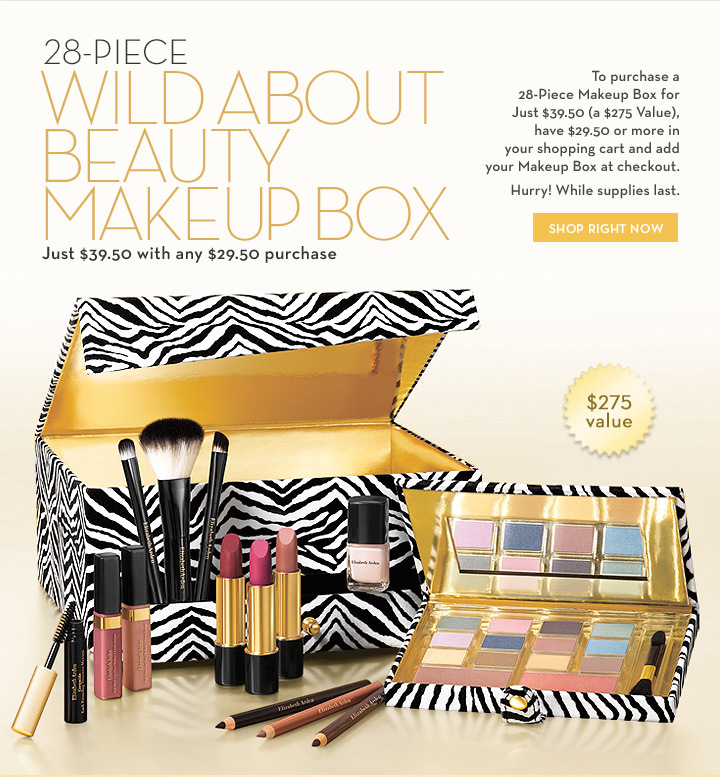 With any $29.50 order, you can purchase a 28-pc Makeup Box for just $39.50 (a $275 value). While supplies last. Estee Lauder offers free 4 samples of your choice with any $50 purchase. No code needed. Valid thru Sep 11. Jurlique offers free travel size Purely Bright Radiance Serum with any purchase. Enter code RADIANT at checkout. While supplies last. Sally Beauty offers 20% off any $50 purchase. Enter code 555252 at checkout. Valid for Sep 10 only. The Body Shop is having a Buy More Save More promotion. Get 10% off when you purchase 2, 20% off when you purchase 4, 30% off when you purchase 6, 40% off when you purchase 8, or 50% off when you purchase 10 or more items. No code needed. Valid thru Sep 11. Ulta Beauty offers Buy 1 Get 1 Free on Butter London nail lacquers. Enter thru link. Valid for Sep 10 only. Shipping is free with $25 purchase using code 80582. Sasa is having a DKNY Fragrance promotion. 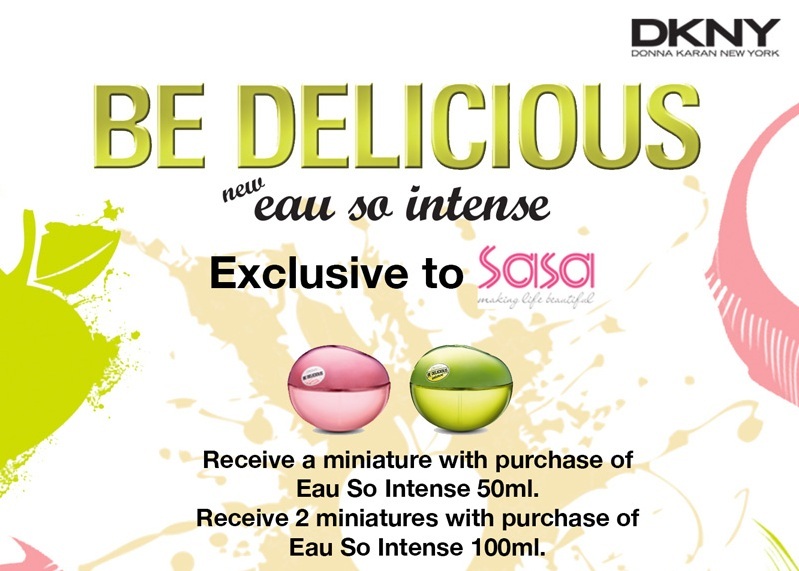 Receive a miniature with purchase of Eau So Intense 50ml, or 2 miniatures with purchase of Eau So Intense 100ml. While supplies last. Ahava offers $10 off your order when you purchase new Comforting Cream and any one of its perfect pairs – Rich Cleansing Cream, Mineral Hand Cream, or Facial Mud Exfoliator. Use code PERFECTPAIR at checkout. Valid for Sep 9 only. Bath & Body Works offers $10 off any $40 purchase. Enter code AUTUMN10 at checkout. Valid for Sep 9 only. Beauty Encounter offers 10% off sitewide. Enter code WKS763 at checkout. Valid for Sep 9 only. Beauty Habit offers free Rouge Bunny Rouge Kiss Elixir Lip Balm with any $85 Rouge Bunny Rouge purchase. Enter code SANTAANA at checkout. Valid thru Sep 20. Carol's Daughter offers free shipping with any $25 purchase. No code needed. Valid for Sep 9 only. Dermstore offers free Jane Iredale Lip Drink with any $75 purchase. No code needed. While supplies last. Folica offers 20% off sitewide. Enter code UNDERCOVER at checkout. Valid thru Sep 10. Giorgio Armani Beauty offers free shipping and 4 minis of your choice with any foundation purchase. Enter code FOUNDATION1 at checkout. While supplies last. H2O Plus offers free shipping and free samples with any $50 purchase. Enter code SAMPLES at checkout. Limited time only. Juice Beauty offers free full size Correcting Concealer and free shipping with any $50 purchase. Enter code CCIVORY for Ivory or CCSAND for Sand color. Valid thru Sep 11 3pm PST. Kate Somerville offers free Deluxe Sample of ExfoliKate Intensive Exfoliating Treatment with purchase. Use Code KSSept at checkout. Valid thru Sept 30. La Mer offers free shipping and a sample of The Moisturizing Lotion with any purchase. Enter code CLEANSERS at checkout. Valid thru Sep 13. 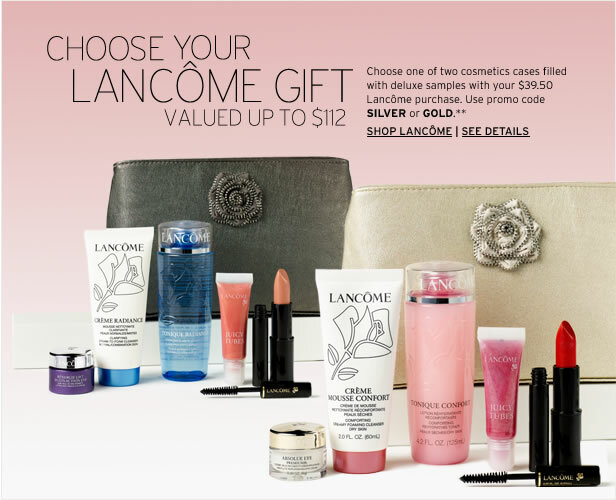 Lord & Taylor offers free 7-pc Lancome gift set (up to $124 value) with any Lancome purchase of $39.50. No code needed. While supplies last. Plus receive a free exclusive Metallic Tote with any $100 Cosmetics or Fragrance purchases. MAC Cosmetics offers free shipping with any purchase. Enter code OVERTIME at checkout. Valid for Sep 9 only. NARS Cosmetics offers free shipping with any purchase. No code needed. Valid thru Sep 14. Pur Minerals offers 25% off all Spring and Summer items. Enter code ENDLESS25 at checkout. Valid for Sep 9 only. Sephora offers free travel size of Benefits Hello Flawless Oxygen Wow Brightening Foundation with any $25 purchase. Enter code WOW at checkout. While supplies last. SkincareRx offers 21% off sitewide. Enter code LEAVE21 at checkout. Valid thru Sep 12. Stila offers a free full size Creme Bouquet Rollerball and free shipping with any $50 purchase. Enter code PERFUME at checkout. Valid for Sep 9 only. Yves Rocher offers 15% off sitewide. Enter code YR15OFF at checkout. Valid for Sep 9 only. 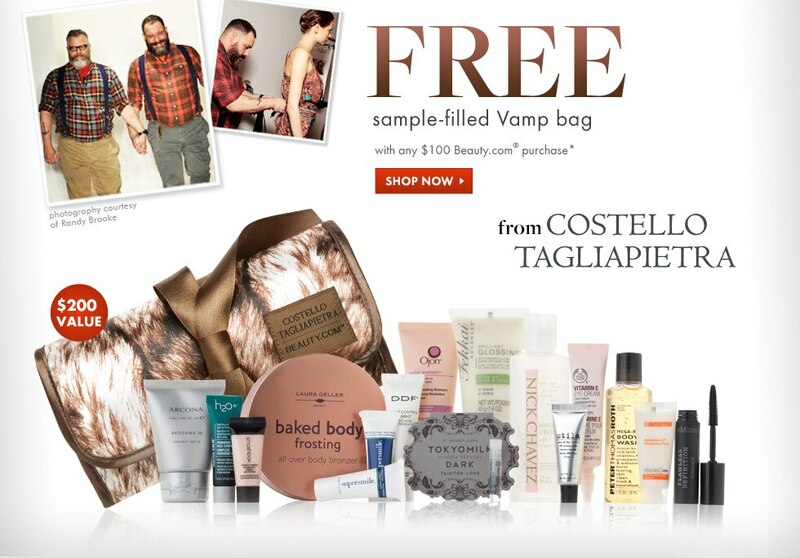 Beauty.com offers a free $200 value sample filled Vamp Bag from Costello Tagliapietra with any $100 purchase. No code needed. Enter thru link. Valid thru Sep 30. Bath & Body Works offers free mini Candle with any $10 purchase. Enter code FREEMINI50 at checkout. Valid thru Sep 7. Beauty Bar offers $20 off any $100 purchase. Enter code BBFNO at checkout. Valid thru Sep 6. Beauty Collection offers a free deluxe Beauty Bag of Natura Bisse fall favourites with any purchase of two Natura Bisse products. Enter code nbfallfaves at checkout. Valid thru Sep 30. Beauty Encounter offers 10% off any purchase. Enter code SCH326 at checkout. Valid thru Sep 7. Benefit Cosmetics offers free shipping on any US purchase, or free international shipping on any $90 international purchase. Enter code DOUBLETROUBLE at checkout. Valid thru Sep 12. BH Cosmetics offers their 88 Color Matte Palette for $9 only. No code needed. Valid from 9am to 9pm today only. 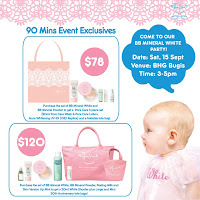 Bliss offers free gift tote filled with samples on any $85 purchase. 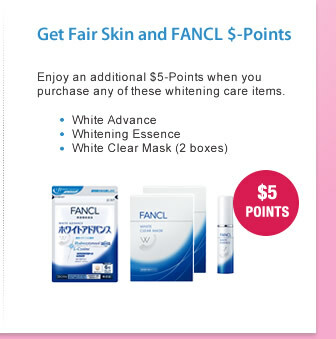 Gift worth $65 includes a free tote bag, 3lab perfect neck cream 6ml, pomega5 botanical eye contour cream 5ml, chantecaille ultra sun protection spf 50 pa+++ anti glycation primer packette, omorovicza deep cleansing mask 5ml, bliss fabulous foaming face wash 60ml, and bliss lid+lash wash makeup remover 30ml. Use code SAVEFACE at checkout. While supplies last. Or receive a $136 valued tote bag with any $120 purchase using code LDAY2012 thru Sep 7. Bobbi Brown offers free shipping plus a deluxe sample of Extra Eye Repair Cream 7ml with any purchase. Enter code UBER at checkout. Valid thru Sep 9. Carol's Daughter offers free shipping on any $25 purchase. Enter code FALLSHIP at checkout. Valid thru Sep 30. Caswell Massey offers 25% off selected Men's Fragrance & Grooming products. No code needed. Enter thru link. Valid thru Sep 23. Clinique offers free shipping and 3 free minis of your choice with any $30 purchase. No code needed. Valid thru Sep 9. DDF Skincare offers free Wrinkle Resist & Pore Minimizer ($12 value) with any purchase. No code needed. While supplies last. DDF Skincare offers 15% off sitewide and free shipping with any purchase. Enter code 15DDF at checkout. Valid thru Oct 3. Dermstore offers a free Jane Iredale Lip Drink SPF 15 with any $75 Jane Iredale purchase. Enter code JIGIFT at checkout. While supplies last. E.L.F. Cosmetics offers free Fall Favorites Collection (a $150 value) with any $20 purchase. Add the collection to your shopping cart and enter code FALLFAVES at checkout. Valid thru Sep 10. Elizabeth Arden is having a 30% off sitewide event. No code needed. Add item to cart to see the discount. Limited time only. Jack Black offers a free Mighty Minis Travel Pack (a $25 value) with any $60 purchase. Enter code PERFECTHAIR12 at checkout. Valid thru Sep 10. MAC Cosmetics offers free shipping on any purchase. Enter code THE212 at checkout. Valid thru Sep 9. NARS Cosmetics offers free shipping on all purchases. No code needed. Limited time only. Sephora offers free Living Proof Hair Primer mini with any $25 purchase. Enter code EXTEND at checkout. While supplies last. Shu Uemura offers free shipping and a Tsuya youthful radiance generator essence sample with any purchase. Enter code YOUTH at checkout. Valid thru Sep 9. Smashbox offers free deluxe sample of Smashbox Camera Ready BB Cream SPF35 with any Mobile purchase. Enter the link thru mobile phone and use code BBLIGHT, BBLTMED or BBMEDIUM for your choice of shade. Valid thru Sep 7. Stila offers free shipping with any purchase of Stay all Day 10-in-1 Beauty Balm. Enter code HDBEAUTY at checkout. Valid for Sep 6 only. Trish McEvoy offers free shipping plus deluxe 5-pc gift on all purchases. Gift includes coveted travel sizes of Intense Gel Eye Liner Deep Aubergine, Beauty Booster® SPF 15 Lip Gloss, High Volume Mascara, Precious Pink Jasmine Eau de Parfum plus a full-size Eye Shadow Romance in a refillable single-decker compact. No code needed. Valid thru Sep 7.